Use this tutorial to learn how to make easy royal icing flowers for decorating cakes and cupcakes. They can be made months in advance and dry hard. These easy royal icing flowers are the most beautiful way to decorate cakes and cupcakes. I made this crazy wacky depression cake and frosted it in coconut cream chocolate frosting. 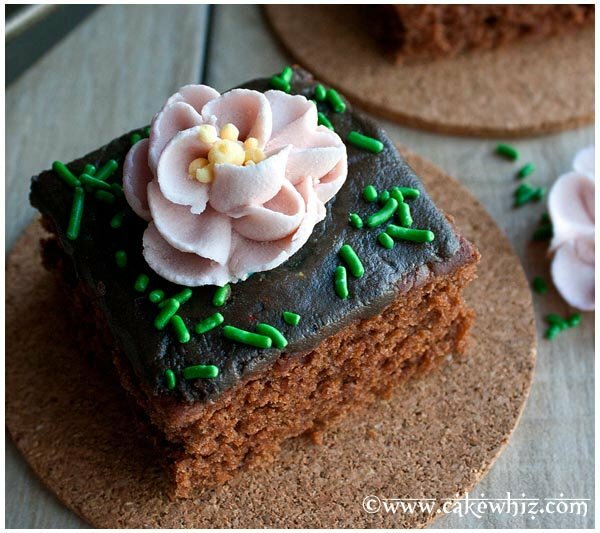 Then, I topped off each slice with some green sprinkles and a pink royal icing flower. If I am ever feeling down and under the weather (which seems to be the case lately! ), I have noticed that making “flowerry” desserts really helps to BRIGHTEN my mood and lifts my spirits. These flowers can last months WITHOUT going bad, when stored properly away from sunlight and moisture. They are delicate just like fondant or gum paste flowers. So, store them safely in a cardboard box in a top cabinet. 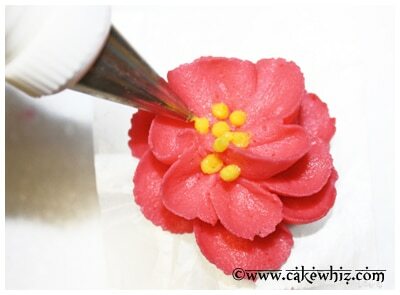 The drying time for your royal icing flowers will vary, based on the humidity in your area. High humidity = Slower drying time. You can position a small portable fan near the flowers to dry them quicker, if you like. 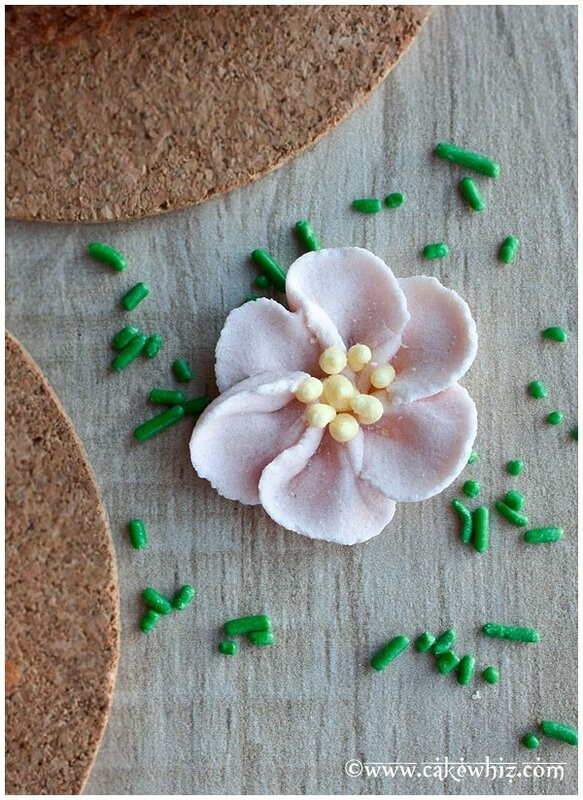 It’s a GOOD idea to make lots of these easy royal icing flowers in advance. This way, you will always have flowers for LAST-MINUTE parties. 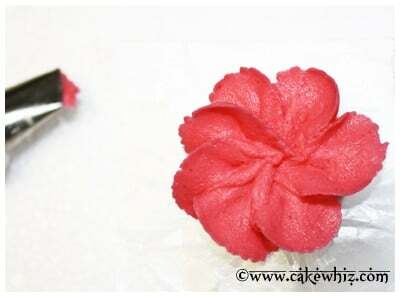 Some people have asked if they can use glace icing to make these flowers and that does not work well. You must to use royal icing. Cut out small square pieces of wax paper. 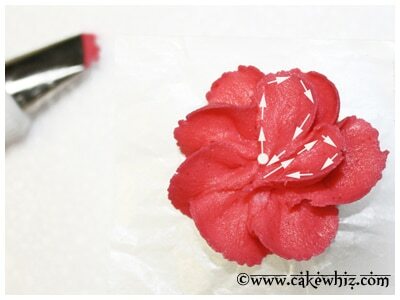 Stick the wax paper on top of the flower nail with some icing. 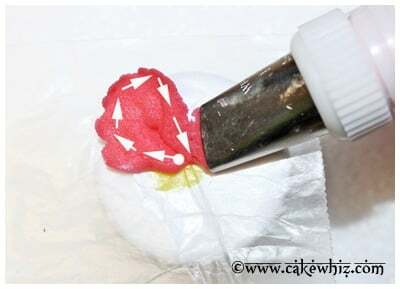 Fill a piping bag with pink royal icing and attach Tip #104. Hold your piping bag at a 45 degree angle in the center (the wider end of the tip should be at the bottom and the narrow end should be at the top). Make a “loop” with frosting, as shown by the arrows. This will be the first petal. Repeat Step 2 a few times until you have a full circle of pink petals. You can stop here and make little yellow icing dots in the center. Make another circle of petals by piping “loop” shapes, like you were doing earlier. 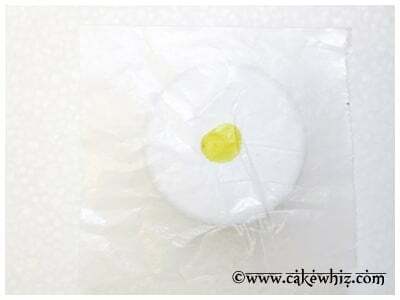 Fill another piping bag with yellow royal icing and attach Tip#3. Pipe little dots in the center of the flower. 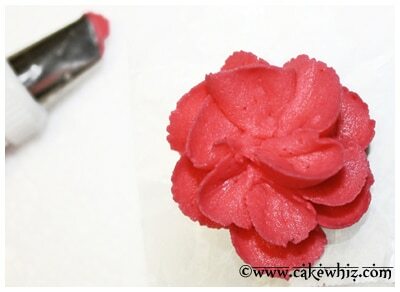 Push your flower nail into a styrofoam block and let this flower dry overnight or until it hardens completely.